I cannot think of a better place for Rob and Taylor's engagement pictures to be taken than in the beautiful Blue Ridge Mountains. 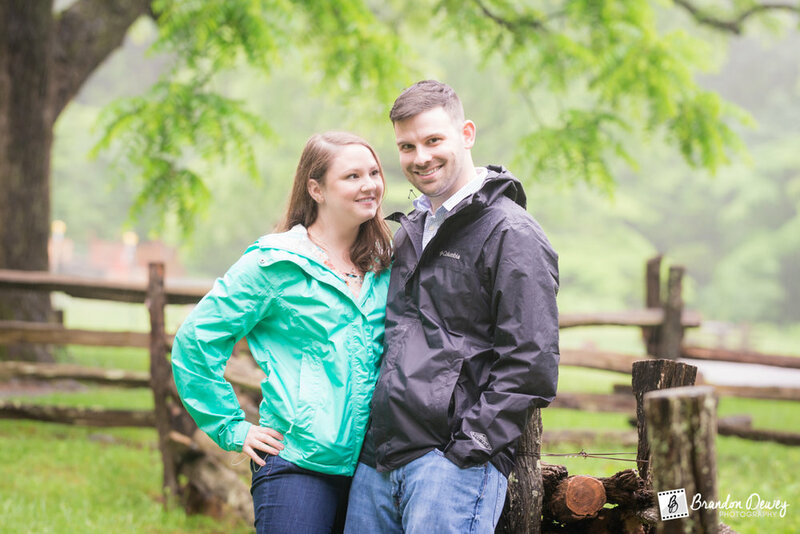 Virginia has had a very rainy spring this year, but Rob and Taylor willingly embraced the rainy weather but hoped for a break in the storm. Luckily, most of the heavy rain hit just before we got to the mountains. We got some light rain at the beginning but then got a nice break in the weather. I was really excited when Rob and Taylor told me they wanted to take their engagement pictures in the mountains. Rain or shine, the mountains are always gorgeous, and on this rainy day, they made the perfect background for Rob and Taylor's pictures. Click here to view all of Rob and Taylor's engagement pictures! Click here to view Rob and Taylor’s wedding pictures! Colonial Williamsburg is beautiful year around, but there is something special about being in this historic town around Christmas. For Christmas, Colonial Williamsburg decorates the entire town with authentic Christmas decorations. With unique and beautiful Christmas wreaths on every door, Rodger and Sarah wanted to have their engagement pictures taken in Colonial Williamsburg. Nick and Kim's engagement images on a beautiful day in Harpers Ferry, WV. The rain stopped just in time to capture this wonderful couple. Mike and Melissa wanted the Richmond skyline in some of their images, so we went down town. I had a great time capturing this beautiful couple last week in down town Richmond. Alex and Brittany's engagement images. It was a beautiful spring day at Maymont Park and Rocketts Landing for Ben And Jessica's Engagement pictures.